Discussion in 'Lift Systems' started by MikeRule, Apr 8, 2018. The bottom eyebolt extending left is extended to lower the lift spring as much as it can be, and it is still the highest corner. The two eyebolts on the top - tight to the harness square - are the lowest corners, and can't be brought up. I'm about out of adjustment. The cables I bought where pre-swaged; the two I was able to compare appeared to be the correct length. However, it looks to me like I need to shorten the two cables w/ eyebolts tightened right to the block, which will allow the lowest corners to go higher. This shift should give me some leeway for the highest corner as well and shift the block. Am I missing something, or is there a better way to go about setting these that I might not have done? Your cables and eyebolts look good. Were they hard to replace? Hi - The cable and eyebolts came as a kit from popupparts.com. I had to remove a fair amount of the inside to repair the floor, bent rails and destroyed pulleys - once they were all in place, stringing them was pretty straightforward. Without seeing the whole system it is a bit hard to know what actually is going on. But just looking at your image, the eye bolt with the shortest cable (Further-est extention) the cable appears to be on an angle from the eye bolt. This seems incorrect to me. Also have the eyebolt ends been tack welded? Did you get them like that? But yeah. You have to wonder if the lengths are correct on the cables. And you definitely want to have some adjustment left on those ones that are maxed out. As they will need adjusting in an other year after they have all stretched a bit. Block should not change as you have one cable adjusted correctly. I think I need somebody that knows what they are looking at to check mine. Install a longer eyebolt if needed ..
Crank your roof up as noted, then support the roof at every lifter post with something that supports it at the correct height ( 2 x 4). Then configure and tension all of your cables to the plate. There should not be any crossing of the cables (which it looks like you have in the picture), they should all run straight out of the plate to their respective pulleys. The square plate should be on a thrust bearing so that it can rotate more or less freely so that it doesn't twist all the cables up on in and out feed. That may require lubrication. The amount of eyebolts threaded in the plate should match more so than you show (will not all be exactly equal). The eyebolts should not be welded shut as you show in the picture. Ideally, if there is an issue, the eyebolts will open up first and fail before tearing apart the system. What he said, I have a 95 JayCo Eagle 12. I took out my lift and reinstalled it after putting in new flooring. He's right, cut 4 2x4's all same length. 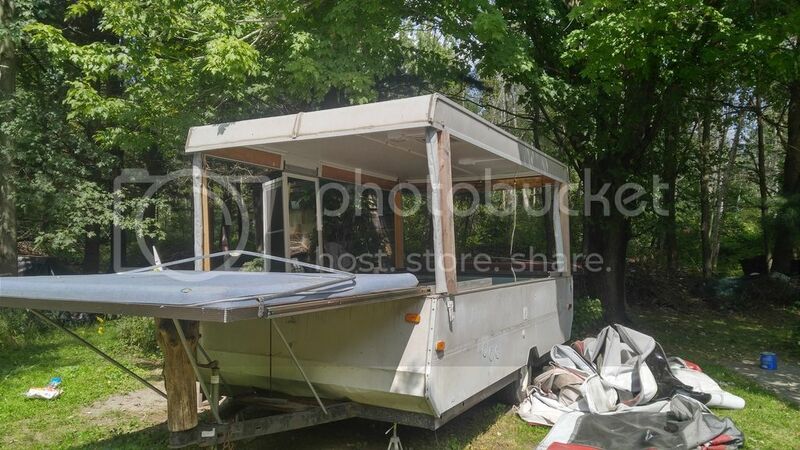 Raise up your roof just enough, insert the boards between your roof side and the trailer side. Then when each cable is pulled to length (roof weight), you will have the cable lengths you need. Thanks for the input, I appreciate it. Well - looks like the roof needs to be torn apart and rebuilt - Not only is the rear roof frame completely rotted, but this has been inside my garage since mid-January, and the center front-to-back support is rotted and sopping wet. Time to cut my losses I think. Thanks for the advice folks. Normal lift height is when the door just fits in. This should be pretty close to where the canvas is taught etc. Oh not a good look there. Certainly means a lot more work. But others have done it and gone to use their camper for some time. I guess it comes down to if you are going to keep it to recoup some of the time and money you have invested in it. And of course if you have the time to do the rest of the work! Good luck on what ever you decide. Thanks - appreciate the support! What's the easiest way to replace your eyebolts? I had one eyebrow bust on me and I just want to change all four. When I opened up to find the broken bolt though I found my cables twisted also. So I have to untwisted my cables as well. Just get a new eyebolt and put it in. Thread the loop through it and then close it back up. One thing you can do is watch the travel of the square plate inside the camper while someone else cranks it up and down for you. The the thrust bearing can turn, the cable should stay straight and not twist. Lube the pulleys if you can and lube the slider posts also. You'll have to support the top - get 4 ratty 1x3s or 2x4s, cut to a length that allow you to get the top up enough to work inside - raise top, place braces, spin the crank as tho you are lowering the top. The metal trim (at least on my pup) on the top will be rigid enough to be supported. I used painters tape to hold the braces to the top struts so they didn't fall away before the weight of the top held them in place.